While this is too long and I spoke about it length on this episode, I thought I would share some photos of my recent woven FO. 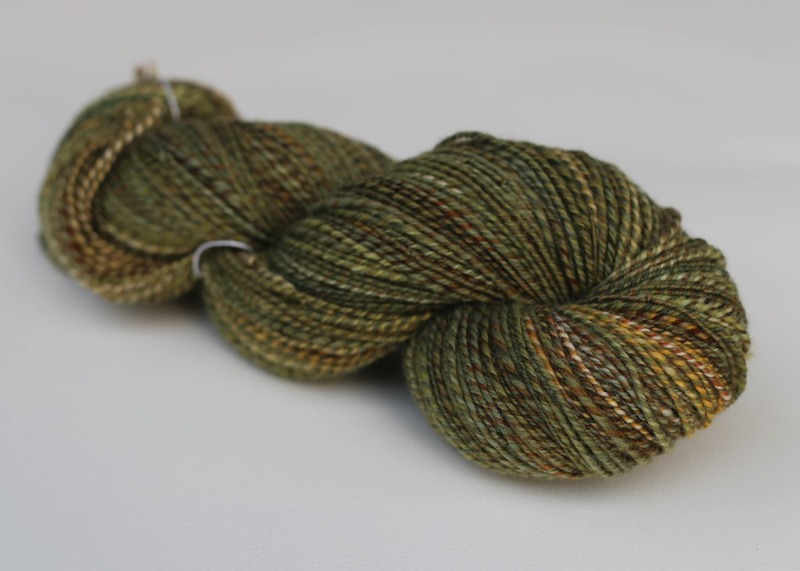 I used my Leading Men Fiber Arts and Spunky Eclectic handspun yarn that I spun in August 2015. It was over-twisted but lovely and light from spinning it over the fold. Some of the leftover singles languished on the bobbins for a long, long time until I finally cleared them off back in the Fall (which is so unlike me to let them languish!)! 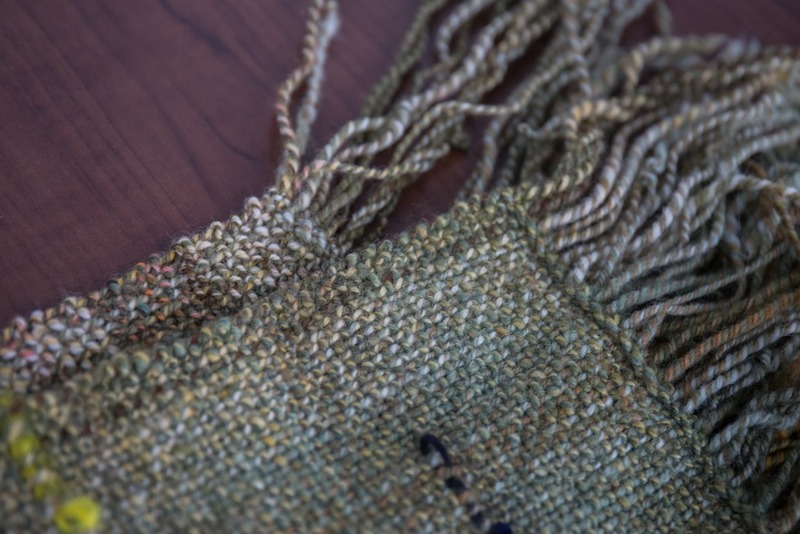 I’ve coveted this yarn since finishing it – not really knowing what to do with it so in the end, I was happy to weave it up into the scarf. The scarf ended up way too long but there are options – like turning it into an infinity cowl and using the rest for project bags. After reading an article on the Schacht Spindle Co. blog, I decided to put in some English Liecester locks to add texture and interest. It livens up the scarf, that’s for sure! 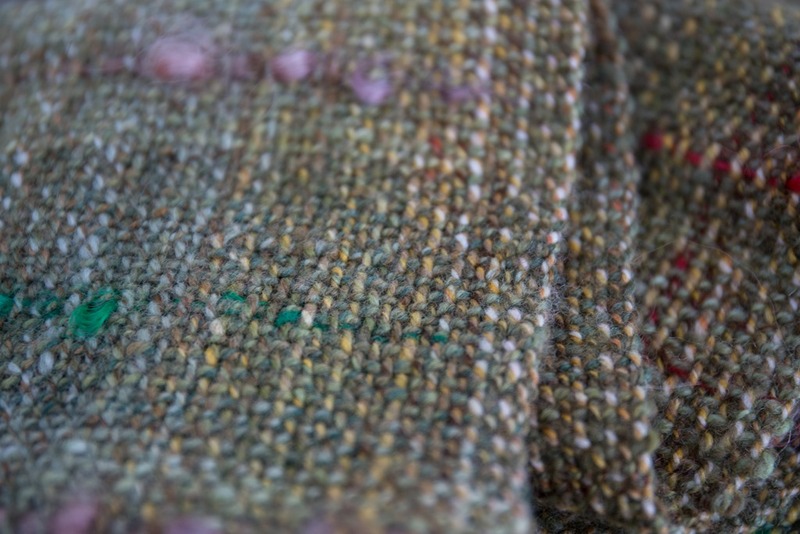 I used my 10 dent reed and just wove plain weave. I wasn’t sure I’d fulled it enough but after chatting with a weaving friend, I’m really happy with the results. It definitely won’t keep shifting around any more and I finished all the ends. Officially, other than trimming the fringe, it’s finished. 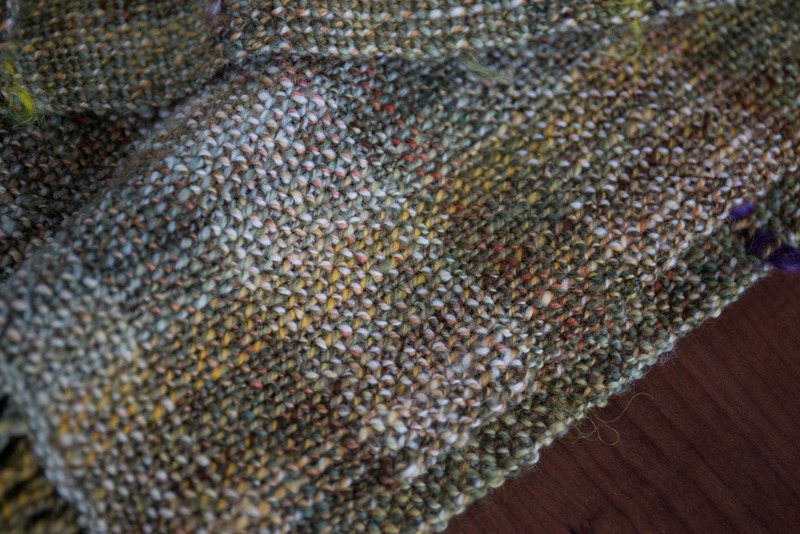 The handspun yarn was very green, which is exactly how this scarf has come out, but there are these really interesting places where the yarn made a plaid! It was awesome to see this patterning come out and these are the places of the shawl that I want to preserve. I was just saying to a friend the other day that weaving is definitely a whole other ballgame. It isn’t particularly like knitting or spinning. While I am incredibly drawn to it, I am woeful that I don’t have a table or floor loom. That’s where I think I would be the most happy in the future and I look forward to those days – until then? I’m going to continue enjoying this process and learning so, so, so much! 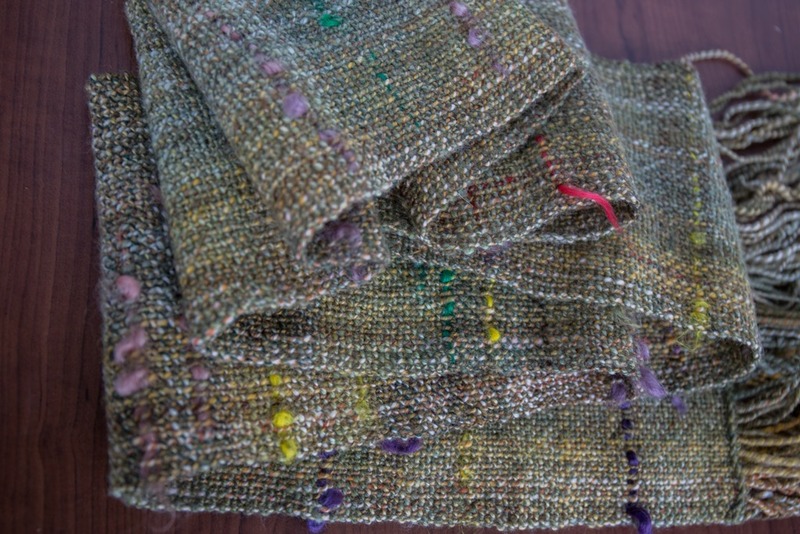 Your adventures in weaving make me want to explore weaving more and more! A friend is making me a small frame loom. 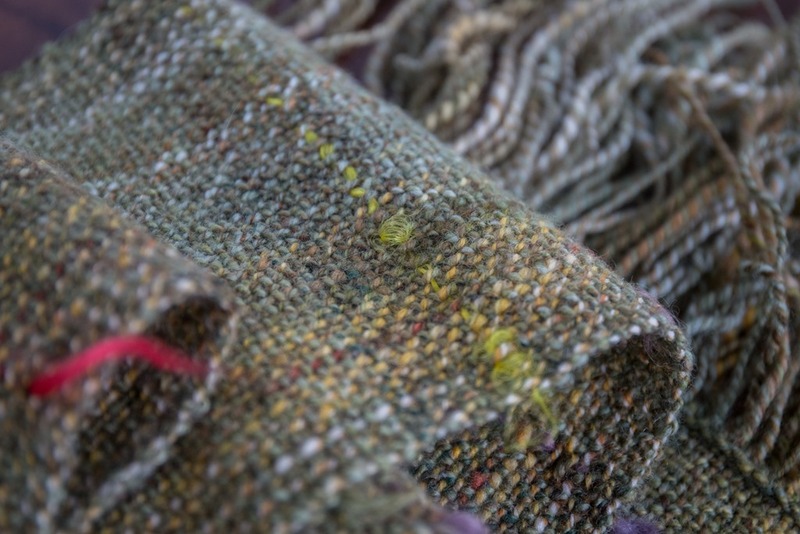 I have a feeling between the small loom and following your adventures, plus joining my local guild, it won’t be long before I’m investing in a rigid heddle loom so that I can make larger pieces of fabric! I love your scarf, can’t wait to see how it transforms. Those locks really make it look stunning. This is beautiful!! I love that you are weaving so much now! It is endless, all the things there are to learn!